Made in Italy, the home of fashion, the Ray-Ban Wayfarer Polarized Sunglasses bring a sense of style to any occasion, be it business or pleasure. As a polarized design, the lenses have been created to reduce glare and dramatically reduce the amount of UV rays coming through them. Previously popular amongst water users to reduce glare, now everyone from athletes to drivers, can benefit from wearing polarized lenses. 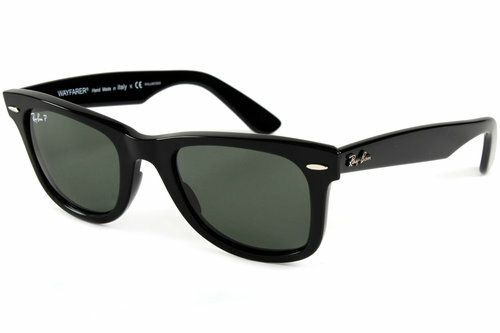 A shiny black finish to the plastic frame sees the signature Ray-Ban logo subtly applied to the lenses themselves. With a green tint to each lens, this absorbs 85% of visible light and blocks out most of the blue light making for a better clarity of vision and remarkable colour contrast.